1. It is from a white farmer (whites are not traditional supporters of ZANU-PF) who I suspect of arse creeping in order to hold onto his farm – maybe. 2. The funds will be administered by the aforementioned farmer, maybe to give an air of respectability? 3. They have had the cheek to set a lower limit of $300000 (about US$15). 4. There is a “deadline” of the14th April. There is an implicit threat to the letter – give us some money or else. Obviously the “or else” is not stated but it may mean “we could make life difficult for you” or not. I certainly don’t support ZANU-PF and don’t have a membership card. I don’t belong to any political party for that matter and cannot see why they shouldn’t go and ask the party faithful for funds; isn’t that what membership is for? Easter weekend was spent in Mozambique with friends. I have been visiting my friend Gary who works for an NGO just outside Gorongoza National Park for a few years now and every time I have been down there I have marvelled at how the Mozambican currency has gained strength against the Zim dollar. The curious thing is that on re-entering Zimbabwe I still feel like I am coming back to civilization. Mozambique is a dirty country; rubbish clogs the streets and it has an unkempt air about it. It does not help that few buildings have been painted since colonial times (1970’s) and the buildings themselves are frequently ugly – the Portuguese were heavy handed with the concrete (though some buildings must have been grand long ago). However, the street lights all work which is more than I can say for Zimbabwean towns. 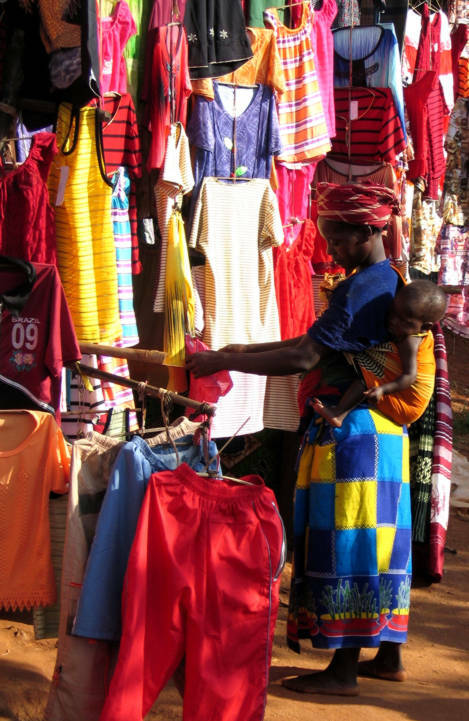 Markets are colourful affairs and we visited one in the local town of Gorongoza where I took the photo. The local speciality is chilli chicken and chips which can be very tasty when done properly. We sampled the local fair in Gorongoza but decided that we would not go back to the particular place that served us chilli paste complete with maggots crawling out of the jar! We survived, probably due to a lifetime of stomach conditioning in Africa!